Update: This page is horrible, and is certainly in need of heavy construction. When will it be completed? Who knows. I have a lot of other neo characters that'll likely take priority over Lu.. only because they are older/their stories all link together. But don't worry, Lu is very important and his character lives on in roleplays. I just haven't gotten this page figured out yet, okay? 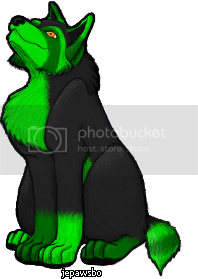 The background is just a background image I found on photobucket. If you think it belongs to someone, let me know and I'll take it down. It's only up temporarily, until I make my own. You find yourself alone in the middle of a dark and dense forest on the beginning of a star-strung night. Stupidly you had gotten lost, and now were frantically searching for a way out of the forest so that you may head back home. While traveling you hear the slight sound branches and leaves flicking together as though there was weight upon the branches. You look up, and looking back down at you were a set of deep orange eyes. The eyes belonged to a fairly built male lupine with an interesting and almost bizarre design. His fur was mainly of a charcoal coloring, which is except for areas on his face, ears, paws, and tail. 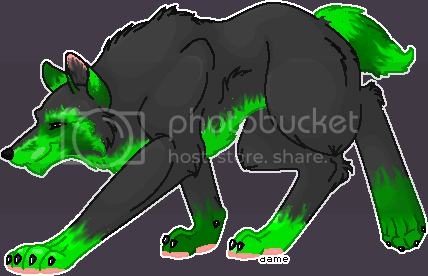 In these areas his fur was etched with flame-like design of two different shades of green. The combination of greens and black upon the lupine's face almost formed the appearance of a raccoon's mask. He jumped down from the tree's canopy, landing in front of you, and tilted his head in curiosity. It wasn't every night that he made such a discovery as a human… especially one like you. Deciding he had been rude enough to stay silent the whole time, the male dipped his head in a kind greeting and then his gentle, yet strong, voice filled the cool crisp night air. 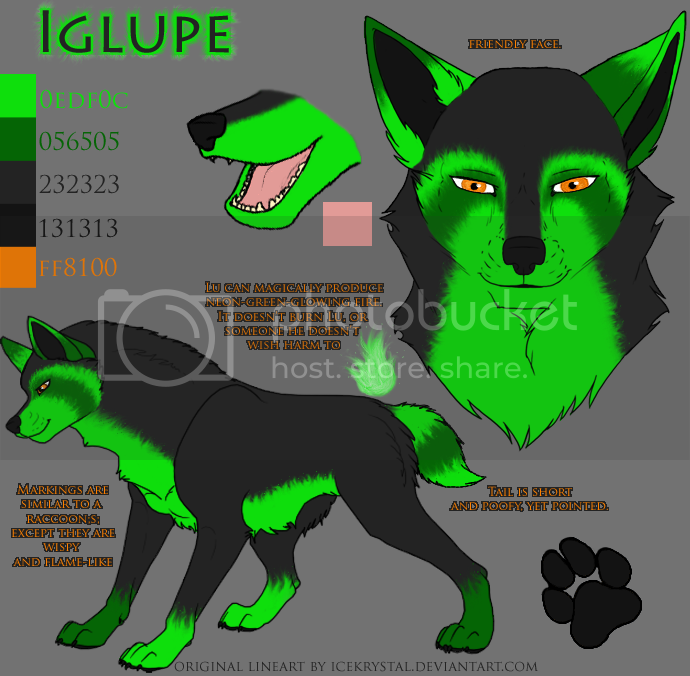 "Hello, I'm Iglupe," he smiled gently, indicating to you more that he was of a kind nature, "but you may call me Lu if you'd like." Lu continued you smile at you with his friendly nature, before he gazed back up towards the tree canopy in which he had just dropped from. "Hmm," he said aloud before facing you again, "I was just heading out to the clearing to get a better look at the stars. If you'd like to join me you are more than welcome. Just like that the lupine turned around and began to weave through the trees and other plants leading you to the clearing. Not every creature has the same preferences, and thus different creatures have different things in which they like, and different things which they dislike. Lu "Apparently I had a life with a pack for years and it all ended when I got caught in the current of a river while trying to fish..." Lu said, as though the past meant nothing to him, "all I remember is waking up, soaked with water and seeing this weird sorcerer spirit guy holding a staff above me, telling me to concentrate on drying, and warmth. I didn't know what was going on at the time.."
Artwork and examples of Lu by either Jessika or others.